The Indian Canyons features more than 60 miles of hiking and walking trails. Not sure where to start your adventure? Choose from some of our most popular trails featured below. Andreas Canyon is considered the world’s second largest California Fan Palm oasis. Ancient rock mortars adorning the entrance to the canyon remind visitors of the presence of the first people. The trail starts at the rail Information Board located just north of the bridge. It leads west along the north side of the perennial Andreas Creek for 0.5 mile, then it crosses the creek at the fence and returns along the upper stream terrace to the parking area. 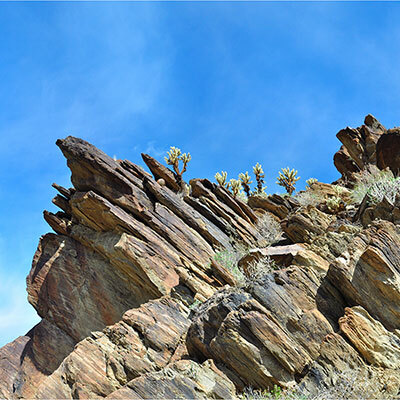 Hikers will be rewarded with spectacular views of rock formations, sycamores, cottonwoods, willows, and the magnificent California Fan Palm (Washingtonian filifera), all surrounded by the harsh desert environment. This is a popular trail in Indian Canyons with a bit of a variation to explore two separate trails in one hike. Murray Canyon Trail is well known for ending at the Seven Sisters Waterfall. On the way back from enjoying the waterfall, take a right at the Coffman Trail junction. Coffman will loop through the desert floor and go left to head back to Murray Canyon. Take Murray Canyon back north which will lead you back to the Andreas Canyon parking area. This trail is one of the most scenic trails in the Indian Canyons. It is best to access this trail by hiking a mile south on the Palm Canyon Trail. The victor Trail will take the hiker out of the shade of the palm trees, up and onto the ridge that overlooks the canyon and return the hiker to the Trading Post making a three mile loop. This trail leads hikers to a seldom seen part of the Indian Canyons. It meanders through the narrow wash of the East Fork of the Palm Canyon Creek with its towering walls on all sides. Huge patches of Teddybear Cholla and agave can be seen along the trail. 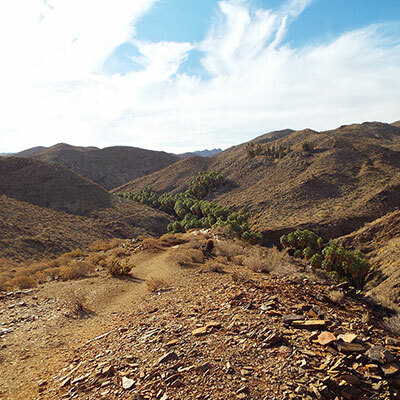 Access the trail one mile south of the Trading post on the Palm Canyon Trail. Through the East Fork, hikers can go north using the East Fork Loop Trail to the Vandeventer Trail to complete their hike. The best way to access the Dry Wash Trail is to take the Palm Canyon Trail south for 2.5 miles. The Dry Wash Trail connects the Palm Canyon Trail and Dunn Road. It provides access to the East Fork Loop Trail. 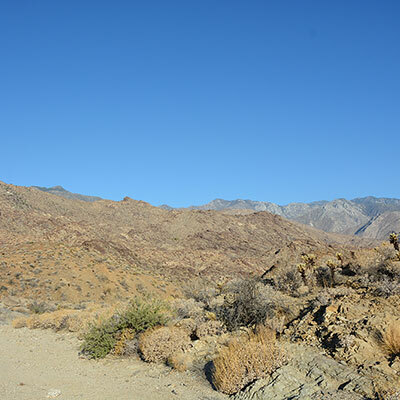 From there you can continue on to the East Fork Trail then back to Palm Canyon for a moderate and picturesque hike. The West Fork North Trail is best enjoyed by combining the West Fork, West Fork North, Coffman, Murray Canyon, and Alexander Trails into a 8.7 mile loop. It’s best to access the West Fork North Trail is from the West Fork Trail. Hike up the West Fork Trail from Palm Canyon for 2.5 miles to the trail junction of the Jo Pond and West Fork North Trails. Turn right or north for the West Fork North Trail or go straight or west for the Jo Pond Trail. The West Fork North Trail will take you up to a spectacular overview of the entire Indian Canyons at an elevation of 2,600 feet. The West Fork North Trail then heads downhill to the Coffman Trail that leads to the Murray Canyon Trail and service road, and on to the Alexander Trail or Palm Canyon Road, and then back to the Trading Post parking area. Only conditioned hikers should attempt this trail. 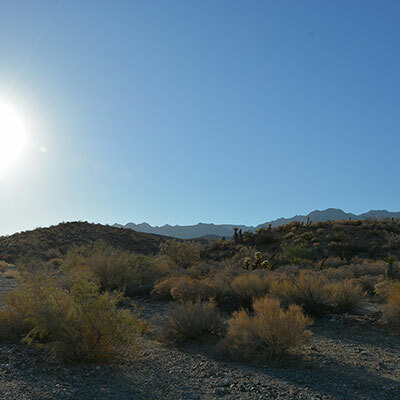 This trail begins at the junction of the Palm Canyon Trail and Dry Wash Trail, about 2 miles south of the Trading Post. 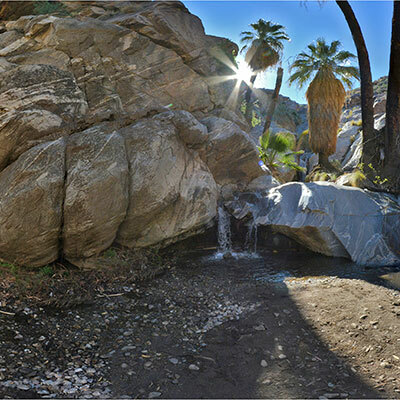 It leads to the upper region of Palm Canyon where a series of stone pools await the hiker. It then takes the hiker up through a hidden plateau surrounded by rock formations, which create a natural pasture. The Indian Potrero Trail connects with the Palm Canyon Trail at the end of the pasture area. Taking the Palm Canyon Trail back to the Trading Post making an 8.8 mile hike, the hiker will be greeted with patches of agave, ocotillo, and the Teddybear Cholla. 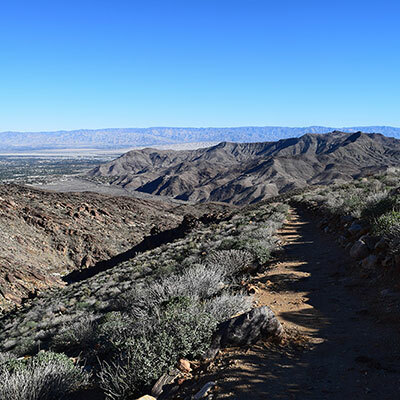 This stunning trail is one of the most scenic high country trails in the Santa Rosa Mountains. At the peak, the trail offers a 360 degree view of the desert cities and the surrounding mountains. 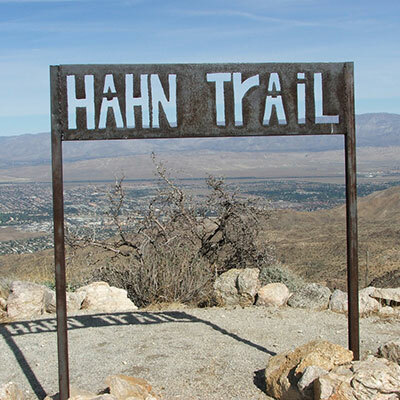 A challenging hike is to make an 12.3 mile loop by taking the Fern Canyon Trail, the Dunn Road Trail, and the Dunn Road, then return by the Hahn Buena Vista Trail to the Vandeventer Trail, and the Palm Canyon hike to the Trading Post. Only conditioned hikers should attempt this trail.